Be cautious about using a thesaurus. 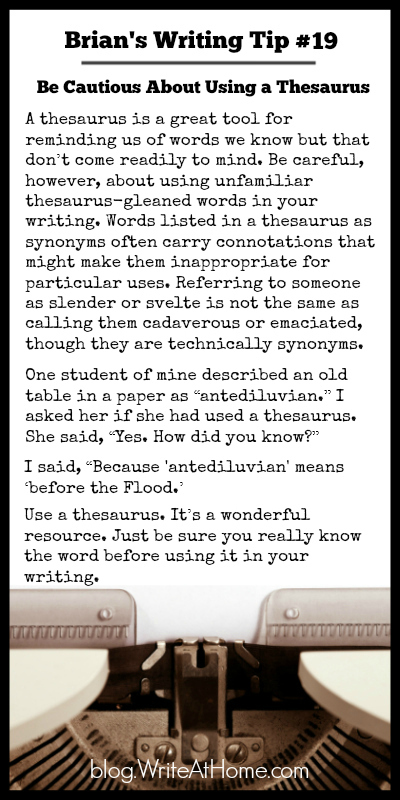 A thesaurus is a great tool for reminding us of words we know but that don’t come readily to mind. Be careful, however, about using unfamiliar words in your writing. Words listed in a thesaurus as synonyms often carry connotations that might make them inappropriate for particular uses. Referring to someone as slender or svelte is not the same as calling them cadaverous or emaciated, though they are technically synonyms. Use a thesaurus. It’s a wonderful resource. Just be sure you really know the word before using it in your writing. Bloggers always appreciate comments. Leave yours below. Go ahead and correct grammer and spelling. It’s okay. Just keep this private if possible, please? Go ahead and correct grammer and spelling. It’s okay.